Heavy rains recently? Your tree roots may be in danger of turning up! Take a good look at tree roots on your property after extended periods of heavy rain or flooding. 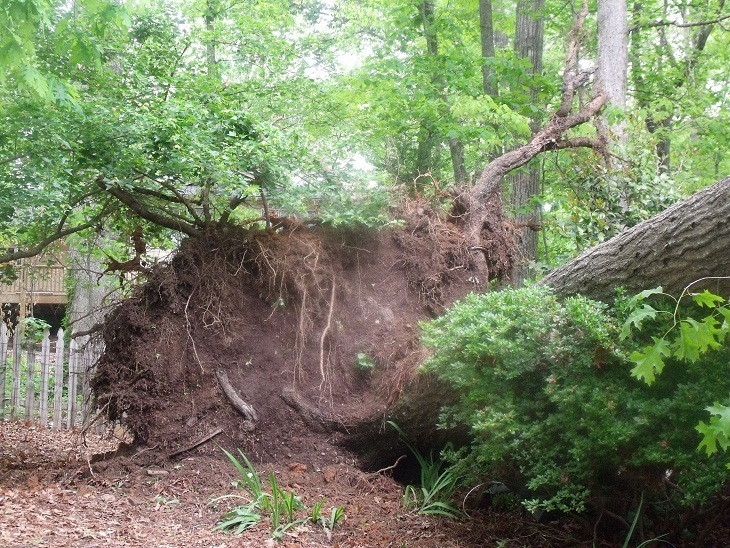 While summertime rain can be a great way to beat the heat, it sure can wreak havoc on the root system of trees and the soil surrounding them. This means the tree could become unstable and soon topple over in a high wind, causing a lot of damage to you (or possibly your neighbor’s) property. While you may think your tree looks healthy, appearances can be deceiving. According to Lohud.com, you must look at how the tree is in relationship to its environment after heavy rains. Is it leaning abnormally to one side, even though it otherwise looks healthy? It could be that the tree had some root damage and started to fall, but found a way to stabilize itself temporarily… but that won’t last! More often than not, gravity will cause the tree to break at its weakest point (those temporarily stabilized roots) and the tree will fall. • Inadequate air to the roots. The flood water gets in the way of oxygen getting from the atmosphere and into the tree effectively. Trees need oxygen, too. • Water changes the composition of soil. Water causes elements of the soil surrounding the tree and its roots to break up into component parts, weakening the soil supporting the tree’s root structure. • Bacteria creep in. Without sufficient oxygen in the soil, bacteria that need oxygen are replaced by bacteria that don’t need oxygen. These bacteria deplete the soils resources (mostly nitrogen), making the soil weaker and less nutritionally dense for the surrounding plants and trees, discouraging growth and creating loose soil. So, take a good look at your trees after extended periods of raining or flooding as they may be in danger of falling down. If you are concerned about the stability of your trees, give us a call at Sharp Tree Service.We can remove that dangerous tree before it’s too late!